Curious about Mt. 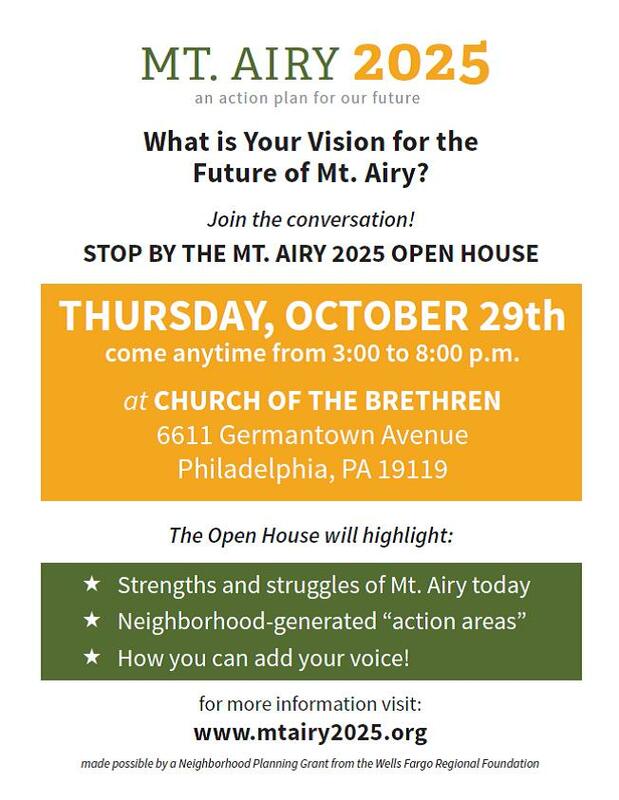 Airy 2025 Progress? Find out what your neighbors have been talking about at our Community Open House! Spend some time walking through our open house to learn information about existing conditions and community-generated focus areas for neighborhood improvement. The 2025 steering committee members will be joined by our consultants from Urban Partners and RBA Group to listen and engage with our neighbors. Tell us your “Big Idea,” fill out a survey, or volunteer to help move the 2025 process forward! We’re excited to show you what’s been going on! We hope to see you October 29th! This entry was posted in Uncategorized on October 19, 2015 by Mt. Airy USA. One thing mentioned June 24th that didn’t make the summary is the urgent need for a crosswalk on Germantown Avenue near the foot of Durham St. or at the entrance to the parking lot by FitLife. Currently there is no crosswalk between Mt. Pleasant Ave. and Mt. Airy Ave.